Toys that help your toddler meet his developmental needs will keep him coming back again and again. The holiday season seems to start earlier and earlier each year and it’s easy to get swept up in the latest toy trends like buying yet another cute stuffed animal. However, with many of us trying to declutter, this can lead to giving an excessive amount gifts that our children won’t use after a few weeks (or even days!). When thinking about what to gift your toddler this year, try thinking about how your toddler will use the toy over the next year, or even two. 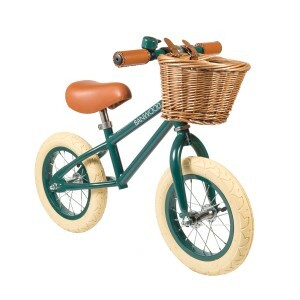 The toys that stand the test of time for toddlers are those that meet their developmental needs. 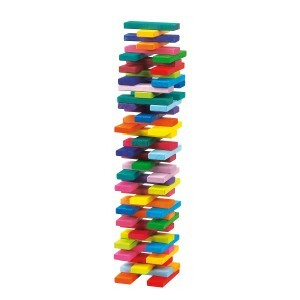 These toys are super fun, but also align with your tot’s inner drive to develop physically and mentally. Toddlers have endless amounts of energy so toys that encourage them to develop their muscles and coordinate their movements are a great option. 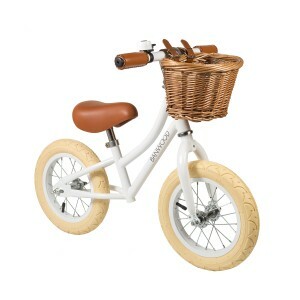 A balance bike is a great way for toddlers to gain the coordination needed for a real bicycle, and this one couldn’t be more beautiful. 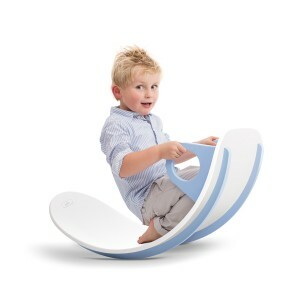 As the weather grows colder, it is priceless to have indoor gross motor options like this see-saw for your toddler to help him use his abundant energy and meet his need for big movement when it’s just too cold outside. These toys help toddlers exercise the muscles of their hands, preparing them for more precise movements like writing with a pencil. 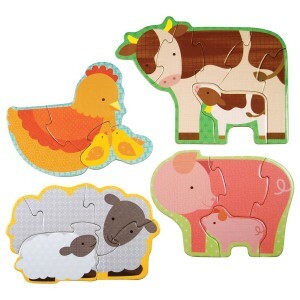 Puzzles are also great for developing problem solving skills. This puzzle is not only beautiful, but the similarity among the pieces offers an extra challenge, encouraging toddlers to really hone their visual discrimination. 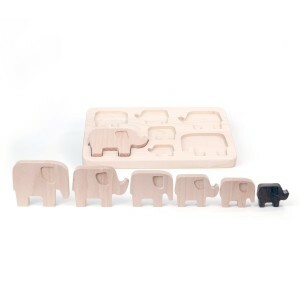 Once your toddler has mastered knob puzzles, they are ready for the challenge of a simple jigsaw. This Beginner Puzzle set is ideal because the four puzzles range from 3 to 6 pieces, so that as your toddler masters the easier ones, you can provide one that’s just the perfect level of challenge. 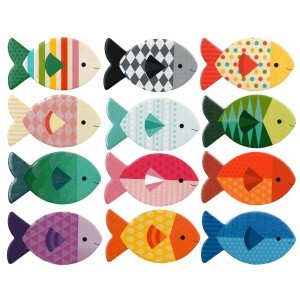 This Fishing memory game is a wonderful gift because it truly grows with your child. A young toddler will enjoy simply looking at the colorful pictures. An older toddler can practice matching the pictures, and then can move on to the greater challenge of playing the actual game. The varying levels of challenge keeps this toy interesting for years. Toddlers love to help around the house. Other it’s helping you to vacuum, sweep, sort clothes or stack the dishwasher, they will be hot on your heels trying to lend a hand. 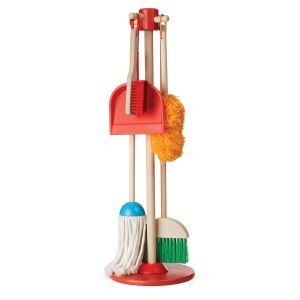 These miniature household tools will enable your child to really get in on the action, and nothing will be more satisfying for you or your tot! Toddlers love having their very own set of cleaning tools to help sweep spills, dust, and join in on any other chore you’re working on. 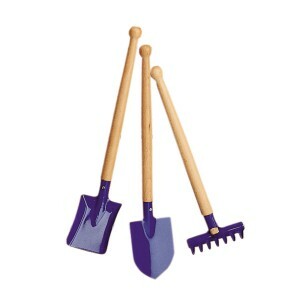 This garden tool set is also an excellent choice. Cooking with your child is not only fun, but can truly help solve the daily struggle of getting dinner on the table. A toddler who is happily engaged helping you mix and chop won’t be hanging on your legs begging you to play. 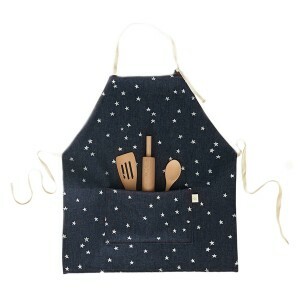 This cooking set by Odette Williams is the perfect gift for budding chefs. Toddlers won’t get bored with toys that let them use their creativity because their experience will be different every time. 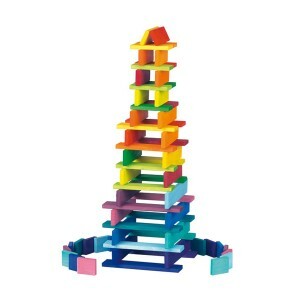 The vibrant colors and natural materials of these blocks make them an excellent choice to help your child explore his creative side. 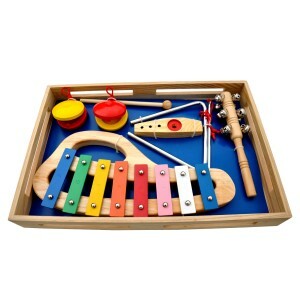 A set of musical instruments makes a great rainy day toy. Bring these out whenever your child seems antsy at home and enjoy discovering rhythm together. The adjustable height of this easel allows your toddler to comfortably create for years as he grows in both stature and ability. 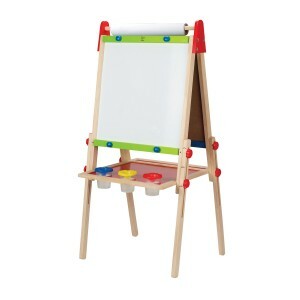 The easel features a magnetic whiteboard on one side and chalkboard on the other. You can trust that any of these toys will light up your child’s face when she first sees it, as well as engage her for many hours in the months and years to come.